Life has been going pretty well for Vanellope (Sarah Silverman) and Ralph (John C. Reilly). They spend their days in their games and get to hang out every evening. Only, Vanellope is getting bored in her game. Every track and secret has been unlocked and she knows every shortcut in the game. She longs for something more. Ralph tries to help, but it results in the steering wheel of her game getting broken. There is only one available on eBay for Mr. Litwak (Ed O’Neill) to purchase to fix it. Unfortunately, it costs more than the game brings in. That means the game will be unplugged and sold for parts. Vanellope and Ralph are desperate to get the new steering wheel to save the game. Mr. Litwak has just plugged in his new router, giving Vanellope and Ralph a chance to get the wheel before the game is unplugged forever. Once Vanellope and Ralph get into the internet, they make their way to eBay and find the steering wheel. When they are confronted about how they will pay for it, Ralph and Vanellope begin searching the internet for a way to earn enough money to pay for it. JP Spamley (Bill Hader) seems to be their only hope. Spamley runs a website where players scour games for highly sought after items to sell those items to other players for real money. The big prize is an item in a game called Slaughter Race known as “Shank’s Car.” Shank (Gal Gadot) and her gang are some of the most ruthless characters in the game. Facing Shank and her gang, viruses, shady dark web characters, and, of course, the dreaded comments sections, Ralph and Vanellope have 24 hours to save Sugar Rush before all the characters become gameless. Ralph Breaks the Internet is the much anticipated sequel to Wreck-It Ralph that left us waiting six long years. After so much time, it can be hard to live up to the expectations. John C. Reilly, Sarah Silverman, Jack McBrayer, and Jane Lynch are all back as your favorite characters. They are just as lovable as you remember, if not more so. Added into the mix this time are Gal Gadot as Shank, who is just as badass as you would expect now that she’s Wonder Woman. The rest of the cast is also amazing, lending their voice talents to some excellently written characters. Wreck-It Ralph was such a unique, well thought out story, it is hard to follow. 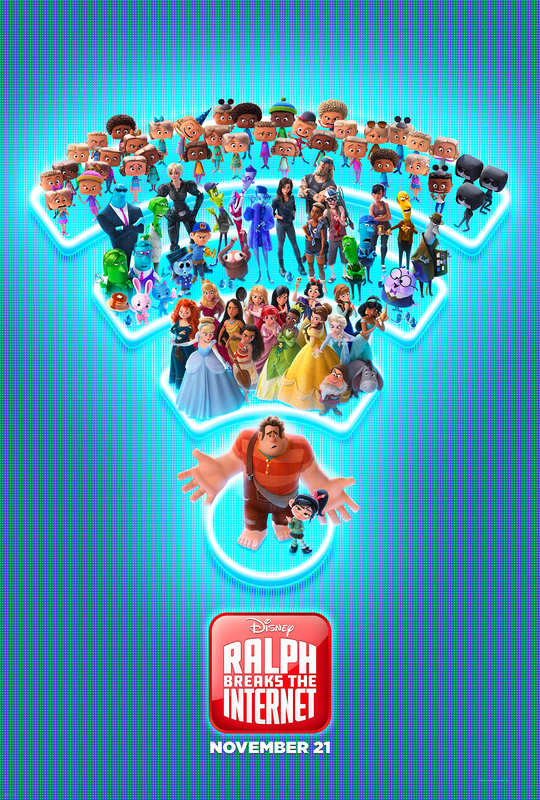 Ralph Breaks the Internet not only meets the level of its predecessor, it somehow manages to surpass it. They go beyond the world of Litwak’s arcade into the “real world” of the internet, fraught with all its dangers. It would be easy to complain about product placement with all the Snapchat, eBay, Google, Amazon, and many, many other companies making an appearance. But if they hadn’t used well-known brands, it wouldn’t feel as authentic. Every character has been developed to the point that you really care about them and what happens. The visuals are, of course, everything you expect from the House of Mouse. Where the movie really soars is in the story. It is touching and appropriate for the digital age in which we live. On top of that, it is incredibly funny. It’s full of witty one-liners as well as a number of self-aware jokes that include just about everything owned by Disney, even “that other studio” and even a Stan Lee cameo. The highlight of the film is when Vanellope finds herself in the midst of the other Disney princesses. That scene is enough to carry the entire film. I’d love for Disney to work on a princess team up film. Ralph Breaks the Internet is just about as close to perfection in a “kids” movie as you can get. Between Ralph and The Incredibles 2, Disney has shown that it doesn’t matter how long it takes to put out a sequel, as long as you get it right. Perfect for a Thanksgiving family movie outing, Ralph Breaks the Internet is definitely one you don’t want to miss.